Today through Monday the jetstream will be north of our area and we will see partly sunny to partly cloudy skies with near normal temperatures and light winds. 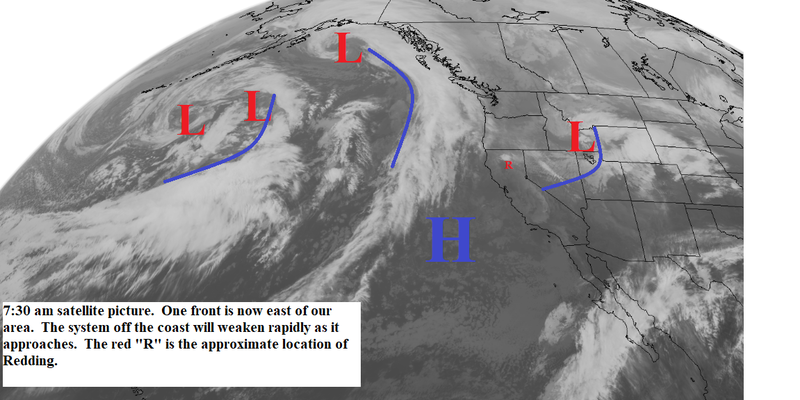 Tuesday the jetstream drops back southward over Northern California and will hold there through Friday (see map below). The first frontal system will move through the area Tuesday with light to moderate rain and gusty south winds. Snow levels will be 5000 to 6000 feet north and 6000 to 7000 feet south. Tuesday night and early Wednesday will be partly cloudy with a few showers. 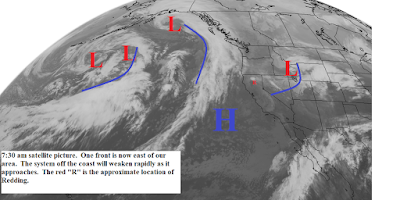 Wednesday night and Thursday a stronger system will bring moderate to locally heavy precipitation to the north state with gusty south to southwest winds. Snow levels will remain high. Friday a weaker system will bring showers tot he area and then on the weekend we will return to partly sunny skies.